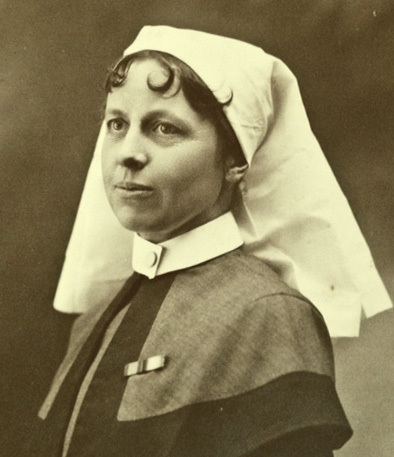 Today is the centenary of the death, in Edie’s care, of James Lennox. Click here for a new post about Edie’s poignant account. In September 2008 I came across this mention of Edie’s diaries. 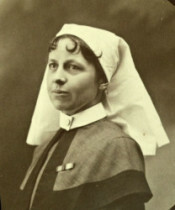 Sue Light (see scarletfinders.co.uk and greatwarnurses.blogspot.com) contacted the Saoirse32 blog to tell them she had…. Additional information: Son of James and Sarah Lennox, of Edward St., Harryville, Ballymena. August 23rd. Lennox died soon after 8 o’c last night. Never have I seen such a slow painful death. It was as if the boy was chained to Earth for punishment. Towards the end it was agony for him to draw the little gasp breaths – & I felt I must clap my hand over nose & mouth – & quench the flickering flame. I am very glad for the boy to be away. I have read Edie’s account of the painful and lingering death of this young man many times and, of course, had formed my own hazy picture of him. To then come across the photograph above was a bittersweet shock. Thank you, Edie, for taking such good care of him. 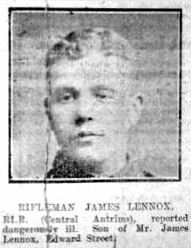 The CWGC page for Rifleman James Lennox. If anyone is able to provide further information we would be glad to hear from you; please get in touch via the Visitor’s Book.